What do you do when a film and TV franchise is starting to show its age? When what was once a series of science fiction TV series and big screen movies that raked in millions of pounds/dollars and millions of viewers starts to show signs of the law of diminishing returns and the viewing public decide to stay away. Easy. Throw everything that had gone before out the window, get a new cast of characters, new writers, new sets and go back to the beginning and to basics. It seems that J.J. Abrams and his team have pulled off a massive coup and presented us with a movie that is fresh, gripping, and rejuvenating a franchise that, to all intents and purposes, seemed dead in the water with Star Trek: Nemesis. While Star Trek: Nemesis was a watchable film, it was plain for all to see that the franchise was rapidly running out of steam and any future releases would have been dire offerings indeed. For those of you who have been hiding under a stone for the past forty odd years, Star Trek involves the crew of the USS Enterprise starship and its five year mission to explore strange new worlds and explore endless opportunities for Captain James T. Kirk to snog female aliens and to speak in that...strange...staccato manner...of......his. Enough has been said of William Shatner, both fair, foul and bizarre has been covered on this fair website of ours. What follows next are pivotal scenes from both Kirk and Spock's childhood and then we see the scenes that lead up to both Kirk and Spock joining Star Fleet. A very humorous scene is where Kirk and a young female Orion girl are locked in a passionate embrace in her quarters. In the throes of their embrace, Kirk is shocked to hear the front door open. Diving beneath her bed, he is surprised to see Uhura walk in and start regaling her room-mate about the trials and tribulations of her day, including a scrambled message she overheard about Klingon vessels being destroyed en mass by an unknown force. Uhura senses that Kirk is in the apartment and shoos him out. A young cadet Kirk, confident and cocky, sabotages the Kobayashi Maru scenario and is hauled before a board of inquiry. Before him faces his protagonist: Spock. Before judgment is passed, all cadets are called away to become crew members on numerous Star Fleet vessels hastily assembled in order to combat the threat posed by Nero's ship, which has reappeared after numerous years. Kirk, upon learning that he has been barred from service pending inquiry, is only able to get on board the Enterprise due to McCoy and a cunning ruse he has devised. Once on board, he is able to inform Captain Pike that it is Nero's ship that is responsible for the destruction of the Klingon ships Only due to a delay in setting off from star base, are the Enterprise and her crew, spared destruction at the hands of Nero. The crew of the Enterprise learn that Nero's ship is headed for Vulcan and make haste to Spock's home planet where Nero's ship is poised many miles above the surface, a miles-long drilling platform has been lowered and a powerful beam is drilling down into the heart of the planet. A mission is launched to sabotage the drilling platform is launched. The drilling platform is subsequently damaged but by then, it is too late. A deadly substance called Red Matter, placed in a stasis capsule by Nero's crew, has been dropped down into the planets core and is causing a chain reaction that results in an implosion at the planets core and the destruction of Vulcan as a black hole is formed. Spock manages to beam down to the planets surface and rescue some of the members of Vulcan's High Council but one of those who perished was his very own mother. The whole crew are numbed by the events that have just transpired and even Captain Pike, who has gone over to Nero's vessel in a shuttle in order to parley and negotiate, has been taken hostage. They then learn that Nero is intent on committing the coup de grace by visiting the same fate on Earth as well. It is then that the crew of the Enterprise realise the enormity of the task that has been laid on their shoulders: stop Nero and save Earth. En route to Earth, Kirk and Spock have a heated exchange and Spock, his customary Vulcan aplomb gone, orders Kirk off the ship and has him forcibly placed in a escape pod which is then ejected away from the Enterprise to land on a desolate planet nearby. Upon getting out of the escape pod, Kirk learns that there is a small Federation base nearby and makes his way towards it whereupon , he is set upon by a couple of the planets clawed and fanged indigenous inhabitants. Running from the creatures, he takes shelter in a cave,where the creature manages to break in and corner Kirk. Convinced that his time has come, he is surprised to see a hooded stranger brandish a flaming torch at the creature, scaring it off. Before Kirk can thank his mysterious benefactor, he turns around to reveal himself as an aged version of Spock. 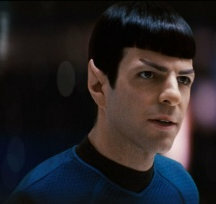 In the conversation that follows, Spock reveals that he was ultimately responsible for the events that have transpired. In Spock's future, he was called upon by the Romulan high command to create a device that would save their home planet as their sun was about to go nova. Using red matter technology, Spock creates a device to halt the explosion of Romulus' sun but it was in vain. Before the device could be deployed, Romulus was engulfed by the fires of its sun and Nero, a simple mining ship commander, so consumed by grief at the loss of his wife and child, creates a black hole to go back in time to await Spock, whom he blames for the destruction of Romulus, and to wreak his revenge on the Federation. Spock, who was drawn through the black hole along with Nero's ship, is captured by Nero, his red matter technology confiscated and he is marooned on the ice world where Kirk finds himself. Kirk learns that Nero's appearance all those years ago has created an alternate time line. In the one that Spock comes from, Vulcan was not destroyed, his mother survives and Kirk quotes his fathers exemplary career as being the main reason for joining Star Fleet. Spock declares that it is imperative that Kirk gets back onto the Enterprise and takes command. When Kirk informs him that the younger Spock is in command, the aged version tells him that he can be relieved of duty if he is deemed emotionally compromised, namely losing his cool and letting his emotions take hold. As the Enterprise is in warp on its way to Earth, they seek out and locate a young Star Fleet engineer called Montgomery Scott, who happens to be languishing in the outpost they are heading towards. Spock reveals that it was a future version of Scotty who devised the calculations necessary for beaming onto vessels traveling at warp speeds. Leaving Spock on the planets surface, Kirk and the young Scotty beam onto the Enterprise where, in order to wrest control of the Enterprise from Spock, Kirk taunts Spock in order for him to lose his temper. This succeeds but in the process, Kirk gets a severe beating from the enraged Vulcan. Kirk orders the Enterprise to Earth as Nero's ship has appeared in the skies above San Francisco and has deployed the drilling platform and is well on the way to visiting the same fate on Earth that Vulcan suffered. Above the surface of Earth, the two ships confront each other. 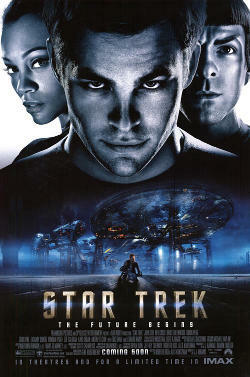 Kirk beams over to Nero's vessel in order to rescue Captain Pike. A confrontation ensues between Kirk and Nero. In the meantime, the younger Spock takes control of elder Spock's ship which carried the original red matter bomb, and pilots it towards Nero's ship. Spock escapes, along with Kirk and a severely wounded Captain Pike, as the red matter bomb is detonated and Nero's ship is destroyed. You would not believe that the Kirk in this time line was capable of commanding a starship. He is a wastrel, an incorrigible womaniser and as Captain Pike calls him; "...the most intelligent repeat offender in the Mid West...".Only he could recognise the potential that the young Kirk has, given careful nurturing and guidance, to be an exemplary Star Fleet officer. In the courtroom scene that follows, it is clear that the firm bond of friendship that exists between Kirk and Spock in later years has yet to develop. Spock is of the opinion that Kirk is a loose cannon, far too reckless for his own good and a young whippersnapper who needs to be taken down a few notches. Kirk counters his arguments and develops the opinion that Spock is cold and arrogant, even for a Vulcan, and adheres to the rules too much. We all know Zachary Quinto as the amoral killer in the TV series Heroes but he has the role of Spock down to a tee and is a very worthy successor to Leonard Nimoy. As in the TV series, Spock is a very complex character, his Vulcan and Human lineage conflicting with each other We all know that Vulcans are cool, seemingly emotionless and logical but his Human side is very prevalent throughout the film. Early on in the film where a scene from his childhood is depicted, he has just finished a tutorial scene when he is approached by three Vulcan classmates who begin taunting him about his mixed parentage. After coolly stating that this was the thirty fifth day that they had attempted to gain an emotional response, Spock then let his human side take full rein and proceeds to knock seven barrels of crap out of his primary tormentor. A touching scene is where he is making a log entry, shortly after his mothers death and the destruction of Vulcan by Nero's ship. In the log entry, the total number of Vulcans who escaped death numbered only in the tens of thousands and he calmly notes that his race is now '...an endangered species...' There is no doubt that he brings a great deal of empathy to the character of Spock as a man who is fighting a constant internal battle between the Vulcan and Human sides of his personality. However, both the principal characters are almost upstaged by Karl Urban and his portrayal of the grumpy, irascible but extremely competent Doctor Leonard 'Bones' McCoy. Zachary Quinto made the role of Spock his own but it was almost neck a neck with Karl Urban. We are introduced to 'Bones' when Kirk is at the shipyards waiting to pick up his shuttle to Star Fleet Academy in San Francisco. The comparative peace of the shuttle where everyone is immersed in their own thoughts is shattered when McCoy is none too gently ushered into his seat by a security guard. Sitting down heavily in his seat, he loudly declares to all and sundry that shuttles are prone to hull fractures subjecting everyone to explosive decompression and that no-one should ever get him started on the subject of Andorrian Shingles. Interrupted in his tirade by the sight of Kirk sitting next to him with an inquisitive look on his face, he introduces himself and says that the only reason he is joining Star Fleet is to escape a messy divorce with his wife, who has taken everything and left him with nothing but '...the bare bones...' and very little else. In that moment we discover how McCoy got his nickname and witness the foundations of a very firm friendship being laid. Lieutenant Uhura was woefully underused in the film, I thought. Apart from a scene where she reveals that something is afoot out in space after monitoring various transmissions; namely the appearance of Nero's ship and the destruction of a group of Klingon warships, her appearance was only token. However, what scenes she got, she shone in. A verbal sparring bout with Kirk in a bar, with a bemused alien intent on having a quiet drink being stuck in the middle of the verbal combatants, produced a few laugh out loud moments. Despite Kirks amorous intentions, he never got to first base with her and is greatly surprised, later on in the film, not only to find out that she is having a romantic liaison with Spock, as shown in a touching scene where Kirk joins Spock in the transporter room, only to find him in a tender embrace with Uhura, but to also find out that Spock has found out what Uhura's first name is. My esteemed colleague on this fair site of ours: Real Keith, does state a very valid point that in the original series, the relationship between Spock and Uhura goes deeper than what exists between two officers of differing rank. Despite the new movie being a complete revision of the Star Trek mythos, some things never change and her uniform is just as abbreviated with just the right amount of shapely thigh being revealed. Chekhov has had a make over as well. Gone is the Davy Jones 'Monkees' comb-over hairstyle, to be replaced by a curly mop of hair but the Russian accent still remains when ever he calls Kirk: 'Keptin'. In the original series, Chekhov is a man in his early to mid-twenties but in the movie, he is only seventeen but already an Ensign. He is possessed of a rapier-sharp mind and that is put to the test when he is required to perform an emergency transporter lock on Kirk and Sulu. There are many moments of dry humour throughout the film. Chekhov, as we all know, pronounces his v's as w's . At one time he is required to activate something by spoken security code. The words '...victor victor..' elude him temporarily, the ships computer does not recognise '...wictor wictor..' and he has to compose himself phonetically before continuing. Even Sulu, ever calm and composed, has something of a D'oh moment. The Enterprise is part of a task force sent to face the threat posed by Nero's ship. All the other ships of the task force have gone to warp speed from the star base and only the Enterprise remains. Captain Pike gives the order to go to warp but nothing happens. He has left the warp speed equivalent of the hand brake on and he needs reminding to take it off. Sulu, his cheeks burning, does so and the ship is then ready to continue. Sulu, very ably portrayed by John Cho, mirrors the original in the fact that he is a dab hand at fencing and that is put to the test where he and Kirk are in hand to hand combat on the drilling platform suspended above the surface of Vulcan against a band of bloodthirsty Romulans. Spock, even though he is calmly logical, has his moments too. Kirk has taken command of the Enterprise and is sitting in the command chair pondering upon a problem. Spock, walking past, offhandedly says '...out the chair...' as though Kirk is dog that has jumped up into Spocks favourite armchair. Quite a few voices have been raised in protest and query about the casting of British comedian and actor; Simon Pegg in the role of Scotty. I think I would have to quell the dissenting voices as I think he carries off a young Scotty very well. One amusing anecdote, in a tip of the hat to the series 'Enterprise', he told Kirk about a transporter experiment he conducted with one of Admiral Archers pet beagles. When asked whether the experiment was successful, he replied that he would know when the beagle eventually rematerialised. A mention must be made of Eric Bana, who plays Captain Nero. Even though he is the technically the bad guy, one cannot but feel a small amount of sympathy with him. As with all people like him, he cannot be painted in black or white but in shades of grey. He was just an ordinary man driven to do extraordinary and violent things. What he did was reprehensible, especially the destruction of Vulcan by the red-matter black hole device but his motivations were driven by a deep seated sense of rage, grief and anguish at the loss of his wife and unborn child and for the destruction of Romulus through Spocks experiments in red matter technology. He feels, that through Spocks experiments, the destruction of his home world and the loss of his family, he is suffering and everyone else should therefore feel his grief too. The special effects are second to none and the cinematography is spectacular and gives you a real impression of how big space really is. Some of the camera shots give you the distinct impression that the cameraman, clad in a space suit, has been shoved out of an airlock and is filming certain scenes while floating in the vacuum of deep space. Some of the scenes have a jarring intimacy to them, such as some of the space battles. The scenes where the Enterprise is locked in combat with Nero's ship make good use of sweeping and sometimes disorientating camera angles that have the viewer clinging onto the arms of their seat. On the subject of the Enterprise, gone is the collection of cylinders, struts and saucers to be replaced by a ship that still pays homage the starship of old but is now something that is sleeker and more powerful and more akin to the USS Enterprise of 'The Next Generation' and the USS Voyager. The interior of the ship has undergone a radical transformation as well. The bridge is definitely more open, spacious, high-tech and contemporary. Gone is the view screen that dominated the bridge to be replaced by a large port-hole/window that is capable of a heads-up display as used by 21st century fighter pilots The transporter room still remains pretty much as it did in the original series, with its raised circular dais and the six pads placed equally around the circumference. It is in engineering that there is change. Gone is the quiet hum of computer consoles to be replaced by an area that resembles a factory floor, more than anything else. The warp core is still there, but it looks more like a hulking monolith dominating engineering. Elsewhere are tall vats, rat lines that crew members can use to get to ground level in a hurry, more reminiscent of an ocean sailing ship than a ship that sails the gulf between the stars and engineering staff literally rubbing shoulders through working in close quarters. My advice is: go and see this film, as many times as you can and then buy the DVD when it is released. It has given the Star Trek franchise a much needed shot in the arm. It has stripped down the essentials of all the movies and the original TV series, sorted out the best elements of each and remodeled them into something new, fresh and yet still retaining all that is best. One thing I am sure of is that Gene Roddenberry; his mortal remains tumbling around in orbit in his capsule, would heartily approve.